Paperback of the Second Edition is available from Amazon. American-Canadian English —ACE— is both the native dialect of the over- whelming majority (almost 74%) of native English speakers, and the standard for International Business. ACE is the oldest national dialect of English, preserving grammatical capabilities and distinctions of vocabulary that have been lost in British English and other dialects. ACE is, in fact, closer (particularly in grammar and pronunciation) to the language of Shakespeare than is modern British English, to the point that the performance of Shakespeare's works in modern British could be considered an anachronism! This grammar is written to the exacting standards of the traditional way of teaching English, in which understandability and best-effect take precedence over the jibberish produced by the pseudo-psychology of undisciplinable self-esteem-ism. QCEG starts with a quick, high-level survey of the English language, aspects of its history and dialects. Then it presents schemas of the parts of speech and aspects of each that will be treated in the text. 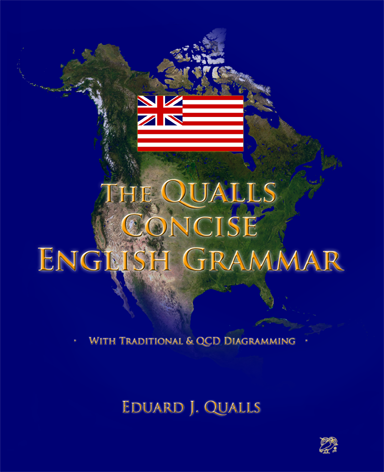 The grammar itself proceeds through each part of speech, starting with general descriptions and progressing to more detailed points and explanations. After this, aspects of the sentence are covered, followed by concise rules for capitalization and punctuation. Within the section for each part of speech and for the sentence are given points of correct or suggested usage. Copious examples are given for each description, rule or suggestion. The final part of the text covers Structural Analysis of sentences and the clauses of which they are constructed. Parsing is treated first, with parsed selections taken from the examples given in the Grammar portion of the text. After that, extensive instructions are given for traditional diagramming and for an updated adaptation of traditional diagramming called Qualls Concise Diagramming. QCD is built on the constructs of Reed/Kellogg diagramming, but incorporates improvements, in particular to representation of compound and complex clauses and components that, in their Reed/Kellogg format, too often resulted in indistinct representation or in spaghettification of the traditional diagrams. This book is an excellent study aid for the higher levels of grade school, for middle school, high school and even for college students. It is vital for anyone whose job depends on the quality and effectiveness of their use of English, that is, all those in business, in broadcasting and those involved in writing, whether that be informal, commercial or literary. There are items related to this book available from the Online Shop! The book's extremely thorough presentation of diagramming will please those Americans who have become frustrated both with the current horrible decline in standards of teaching materials and with the lack of thoroughness plaguing modern grammatical instruction. These will want to get copies to give to those friends and family members preparing for college entrance tests or for jobs that are highly language-influenced or that are dependent on clarity, liveliness and effectiveness of communication.